Evergreen Layout System, Global Print/Digital/Social Advertising, Design Guidelines and Launch Film. Adidas Originals has long been focused on the relationship between past and present. Spring Summer 2016 is the introduction of a new dimension to the brand: the future. Going against the grain, defining one’s own future rather than the future that has been mapped out by the masses. With it comes the responsibility to define the next era of street style. 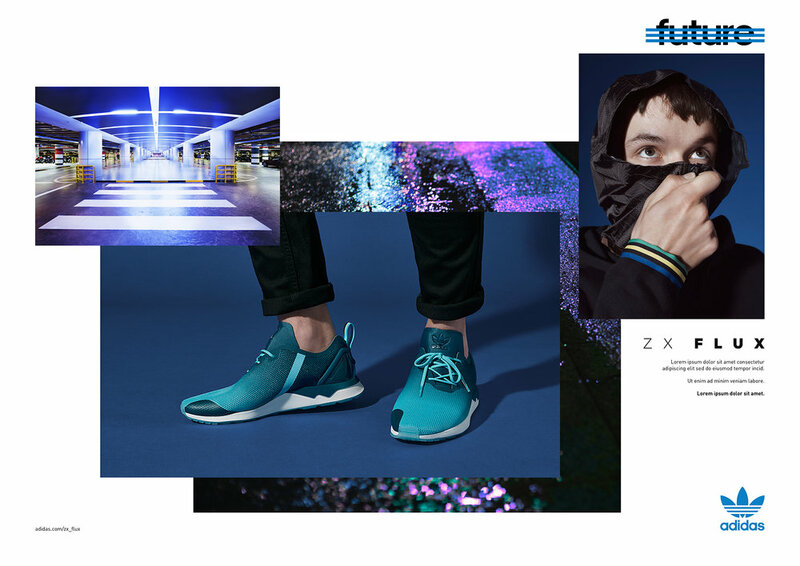 Since the launch of the future campaign, the adidas group's currency-neutral sales increased 22%, with better than expected results, with a majority attributed to the Originals brand. Art Directors: Michael Riso, Elena Miska. Creative Directors: Ferdinando Verderi, Mathew Edwards, Wes Phelan. Photographers: Tryone Lebon, Oliver Hadlee Pearch, Pieter Hugo. Styling: Tom Guinness. Director: Terence Neale. Head of Production: Cedric Gairard. Executive Producer: Justin Lane, Tina Diep.